Issues of strategic partnership between Russia, India and China have been brought up as foreign ministers of the three nations met to discuss the emerging new world order in India’s Bangalore. Russia, India and China call each other strategic partners – that’s why it didn’t come as a surprise that the range of topics discussed at the ninth meeting of Foreign Ministers of these three countries in India’s Bangalore on Tuesday, was rather wide. Boosting cultural and economic cooperation, overcoming the global financial crisis, climate change, energy security, regional disputes and reforming the United Nations – all were among the issues on the table. “We’ve come to understand that the current economic crisis is a reflection of the fact that the global architecture constructed after the Second World War no longer corresponds to reality,” said Foreign Minister Sergey Lavrov after meeting with his counterparts Yang Jiechi of China and S. M. Krishna of India. Calls for a new multi-centered global political structure have been voiced by Russian officials before, including President Dmitry Medvedev. On Monday, during the Russian Foreign Minister’s visit to Sri Lanka, one day before the meeting with the ministers of RIC (Russia, India, China) in Bangalore, Sergey Lavrov stressed once again, that the new system can only be built on the principles of international law and the United Nations. In addition, according to the Chinese Foreign Minister Yang Jiechi, Russia, India and China have become strong emerging powers, and he thinks that if these three partners manage to keep up with the times, they may help to build a new world order, reflecting the diversity of cultures and civilizations and providing prosperity and stability. A communiqué signed at the end of Tuesday’s meeting shows how cooperation between the three states has gone even further. Russia, India and China have started working together in the area of Disaster Mitigation and Relief, with the latest meeting on it held in Samara in Southern Russia in July 2008. A meeting on agricultural cooperation is planned to be held in November/December 2009 (as the territory of Russia and India stretches over 20% of the world’s landmass) in New Delhi, and a Health and Medicine group meeting is scheduled to be held Russia in 2010. According to the communiqué, Russia, India and China are reiterating the need for reforming the United Nations in order for the organization to be able to react to global challenges more quickly and effectively. All three sides severely condemn terrorism and are calling for strong international cooperation, particularly within the framework of the UN. Energy is also quite an important part of the relations between these three nations, and it’s no wonder why – Russia is a major supplier of oil and gas, while India and China are major energy consumers. Another issue bringing the three states closer is Afghanistan. The RIC says it is more than interested in eliminating the terrorist threat near its members’ borders, and is discussing ways to help the country recover economically. The Foreign Minister’s statement comes as Russia recently opened an air transit route through its territory for US planes delivering cargo to Afghanistan, something which many saw impossible during the last years of George W. Bush’s presidency. So, can this be the beginning of a shift in the global political system which still often seems haunted by the ghosts of the Cold War? “The Bush administration used to have quite a one-sided understanding of collective efforts… Washington used to make the decision on its own, be it in Afghanistan, Iraq, the Middle East or elsewhere, and then proposed everyone else to support it. And Barack Obama has a different philosophy – one of collective actions, which doesn’t include everyone following what Washington says, but on the contrary – points out the need for joint analysis and a collective approach to finding solutions. At the moment the old Bush approach is still coming through on the lower levels of power… but we feel that President Obama has a clear understanding of the need to get other states involved, if they can contribute to finding a strategy. It will take time until the President’s ideas are put into motion,” says the Russian Foreign Minister. 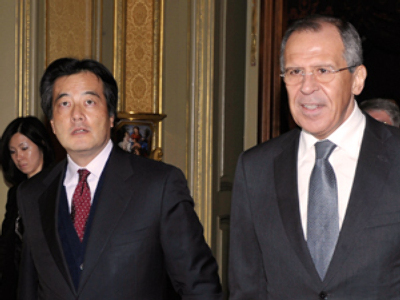 The next meeting of the Foreign Ministers of Russia, India and China is planned to be held in 2010.